Late November, Clark Field, Phillipine Islands. 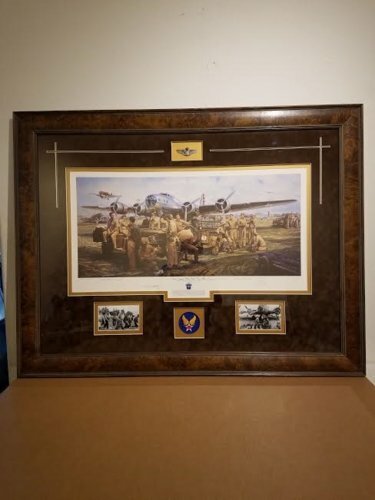 Overall Size: 37.5" x 21.75"
Some of America’s first heroes of WWII, such as Colin Kelly and Harl Pease, are depicted in this scene just prior to the outbreak of war at Clark Field, Philippines. Personally signed by at least 3 great vets of this chapter of history. Late November, 1941, Clark Field, Philippine Islands…The U.S. Army Air Corps prepares for days of infamy ahead. As P-40 aircraft take to the skies, the crews of new B-17 Fortresses of the 19th Bomb Group prepare for the day’s practice missions. Mere days after this scene, Clark Field and other nearby U.S. bases would be savaged by enemy surprise attacks. Many would be taken prisoner, and some of those shown here, such as Colin Kelly and Harl Pease, would gain tragic fame. Among this gallant group were some of the first to inspire America at war, doing so much with so little, fighting with what they had. The personnel shown are as follows: 19th Bomb Group personnel shown in foreground, left to right: Lt. Henry Godman, Sgt. Meyer Levin, Sgt. James Halkyard, Lt. Joseph Bean (kneeling), Capt. Colin Kelly, Sgt. John Wallach, Sgt. J.W. DeLehanty, PFC Robert Altman, PFC W. Money (on bumper). On Jeep: Lt. William Bohnaker, Lt. Edward Jacquet, Lt. Harl Pease Jr., Lt. Jack Heinzel, Lt. Don Robins. Far Right: Capt. Emmet ‘Rosie’ O’Donnell, Lt. Col. Gene Eubank, Gen. Lewis Brereton. P-40 pilot: Joseph Moore.